When a client visits our webpage they can fill out a number of forms which is supposed to be emailed to sales@wehelpyouparty.com hosted by go daddy on a shopify page. When we receive these forms we then contact the person with the information provided to us. We are not receiving our completed forms. I found the forms that have been submitted by clients on our jot form account but once they are submitted by the client we are not receiving the forms in our inbox. Please help. 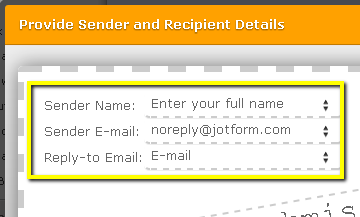 - Sender Name: Choose the Name field of your form. - Reply-to Email: Choose the Email field of your form.